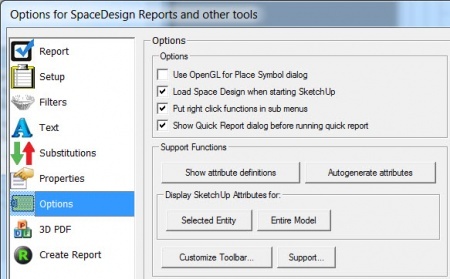 The SpaceDesign Report Wizard creates reports for SketchUp Components, Dynamic Atributes and other Attributes. This show items, with their quantities, and then drills into the them showing the other items they are composed from. There are several tabs, plus some pop-up dialogs to define the report. Include components with no attributes - if checked, then all components appear in the report - even if they have no Dynamic Component or SpaceDesign attributes. Combine components made unique or duplicated ('#' or ' copy ' in name) - if checked then component names will be truncated before any # sign (for "make unique" components), or before the word " copy ", (lower case and with spaces - for duplicated pieces in Dynamic Components). This will report components which have been :made unique" on the same line if all other attributes are the same. This will also report copied parts of dynamic components as the same component. Note: This may cause problems if you use a #-sign or the word "copy" in other components. Takeoff Selected Entities only - only report on selected components and groups. Drill into sub-components level - report on sub-components and components in groups up to this level. Show Totals - A total line is added to the .CSV file and Report to total columns marked as 'Show Total'. Uses the settings from Windows for currency and thousands separator formatting. Does not put commas, (or thousands separators) into CSV output when creating a CSV report. Overrides the default comma as a delimiter for CSV files. Show Report when complete - The report or .CSV file will be launched after creation. Use Skip If Setting - use to skip components which have a Skip_if attribute set. 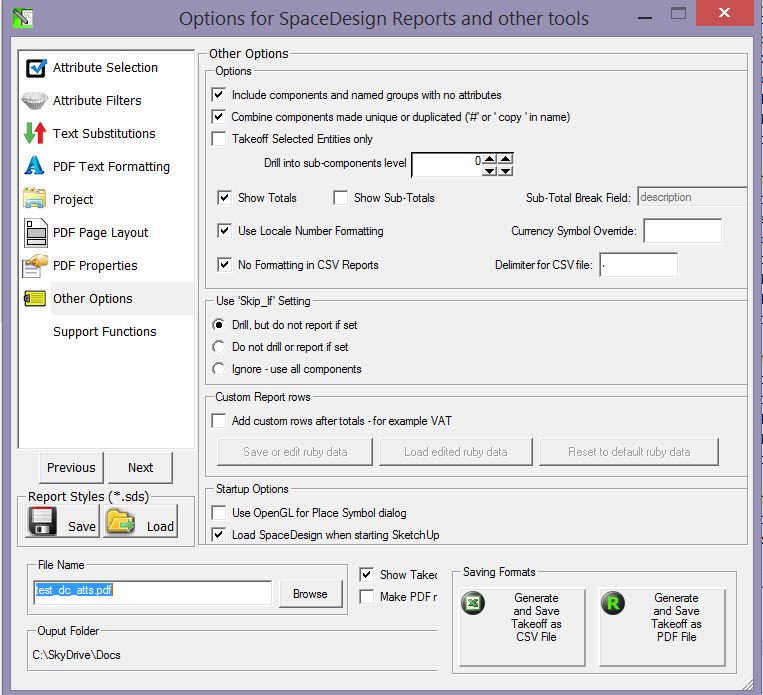 [[File:SpaceDesign Filters Tab.jpg|450 px] Defined filters on which components to include in the report. Size - Letter, Legal, A3 or A4. Position - which corner to place the logo in. Height - height in inches. Clear - remove the logo. Browse - Select the logo from your disk. An image of the current SketchUp model and view can be included in the report. Include Image - if unchecked, no SketchUp image will be included. [[Image:Report text.jpg|450 px] Specify text and font sizes for all aspects of the report. Report Header Font - this determines the size of the column headings for the report. Report Fields Font - size of the report data. If your report does not fit properly on the page, make this font smaller. 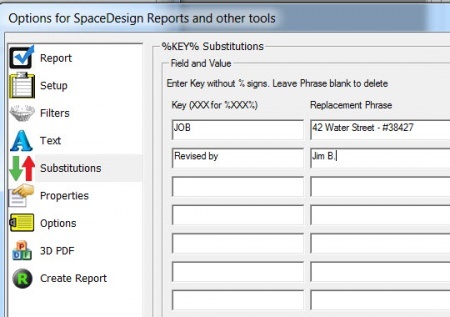 You can also define your own substitutions on the Substitutions Tab of the Report Wizard. These properties are stored internally in the PDF file, and are available to the user if he/shw clicks Properties. Use OpenGL for Place Symbol Dialog - on some computers, and some video boards, our Component Placement Wizard leaves artifacts on the SketchUp drawing window. If this happes o you, check this box to turn of OpenGL previewing of components. 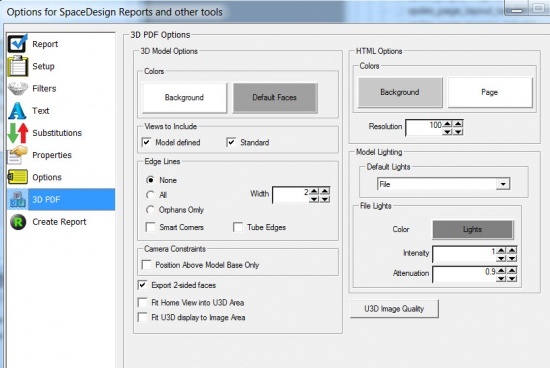 Use this tab to define options for placing 3D PDF, interactive, views into your SpaceDesign PDF file. Edge Lines - if selected, will generate 3D geometry to replicate SketchUp edges and add it to the 3D PDF model. Default Lights - none of these work as well as you would hope in Adobe Reader - Headlamp is a good choice. File Lights - Color, Intensity and Attenuation. 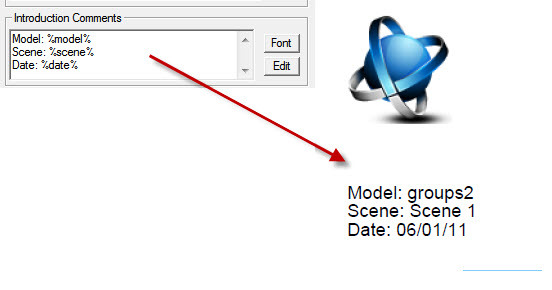 Position Above Mdel base Only - if checked, then the user cannot orbit below the model. Export 2-sided faces - If checked, both sides of each face are processed. This is necessary if some objects are ot closed, or if some faces in the model are reversed. U3D Image Quality - load an additional dialog or more settings. 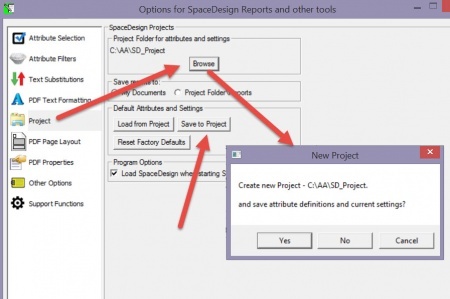 The Project Tab sets the SpaceDesign project folder to hold settings, attributes and reports. 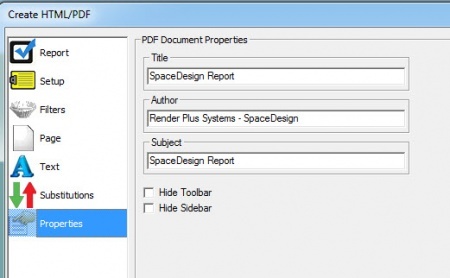 If you set a SpaceDesign Project then default settings and defaults are read from that folder. This list all attributes which were marked as 'Allow on report on the Space Design Attributes spreadsheet. Format - Loads a spreadsheet to determine the order of the attributes in the page, and set the format (e.g. number of decimal places) for each attribute. See: Space Design Report Format . Folder and File Name - name of .PDF and .CSV files. 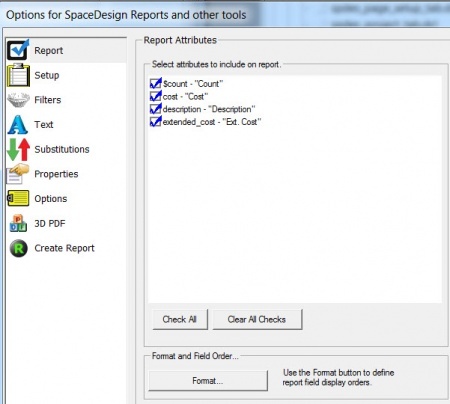 Show Report when Complete - launcches the .CSV file or the .PDF file. Save .CSV file - save the report information as a CSV file.